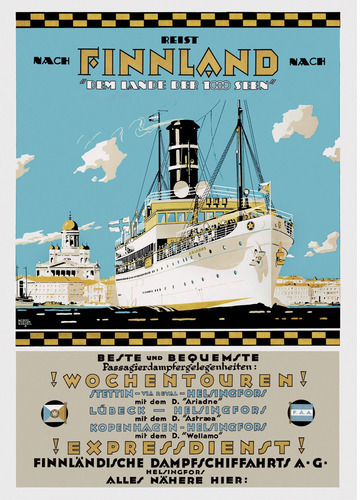 The routes south to Tallinn, Stettin and Copenhagen and westwards to Stockholm had a double purpose. They sent Finns out into the world but also brought back a breath of fresh air from other countries. 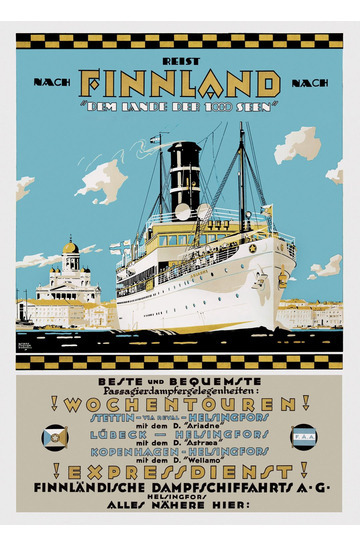 Traffic to Estonia was already popular in the 1930s, and the competition was just as tough as it is today. The first whisky and sodas have imperceptibly materialised in the smoking saloon. Most of the travellers on their way to Tallinn have occupied the majority of the wicker chairs in the restaurant. Some older women have already sought out mutual acquaintances and are sitting in a closed group with their heads together and remembering little stories about their fellow passengers. The conversation in the smoking saloon is becoming louder and more uninhibited. A sea voyage consists of relaxation and a leisurely transition from one meal to another, and one soon becomes apathetic if one cannot find a suitable travelling companion.